The Girl with the Dragon Tattoo is an award-winning crime novel by the late Swedish author and journalist Stieg Larsson, the first in his "Millennium Trilogy". At his death in November 2004 he left three unpublished novels that made up the trilogy. It became a posthumous best-seller in several European countries. Maclehose Press. Hardback. Near Fine/Near Fine. 2008. Hardback. Near Fine. First UK Edition. First Print. Very collectible copy, excellent addition to your collection. Dust jacket is protected with a Mylar cover. Books are packed and shipped in boxes. London: MacLehose Press, 2008. First Edition. Hard Cover. Dust Jacket. First UK Edition. A very fine copy in like D/W. A very scarce book with the full number line 10 9 8 7 6 5 4 3 2 1 on the verso of the title page. This is the first English-language edition of this book and the first in the acclaimed Millennium series. A publishing sensation across Europe and months at the top of best-seller lists. A spell-binding amalgam of murder mystery, family saga, love story, and financial intrigue. A pristine copy. One for the Pension Fund! Seller: James M Pickard, ABA, ILAB, PBFA. London: MacLehose Press, 2008. First Edition. Hard Cover. Dust Jacket. First UK Edition. A very fine copy in like D/W. A very scarce book with the full number line 10 9 8 7 6 5 4 3 2 1 on the verso of the title page. This is the first English-language edition of this book and the first in the acclaimed Millennium series. A publishing sensation across Europe; two million copies sold and months at the top of best-seller lists. A spellbinding amalgam of murder myster y, family saga, love story, and financial intrigue. The third and final book is due to be released later this year and movies are set to follow! One for the Pension Fund! London: Maclehose Press, 2008. First Edition. First Edition. Spine ends very lightly bumped, else Fine and unread in a Fine dust jacket. Basis for the Swedish television series and resulting film trilogy released in 2009, and for the upcoming American version by director David Fincher. MacLehose Press/Quercus, 2008. First UK edition-first printing. Hardcover. Near fine/Near fine. Near fine condition.MacLehose Press/Quercus,2008.First UK edition-first printing(10 9 8 7 6 5 4 3 2 1).Red hardback(silver lettering to the spine, two small dents on the edges of the cover) with Dj(two small nicks and scratch on the edges of the Dj cover),both in near fine condition. Nice and clean pages as new with two ink marks and small nicks on the outer edges,small ink mark and nick on the edges of the pages.Nice and clean book.533pp including The Vanger Family Tree.Price un-clipped.A collectable and scarce first edition-first printing.Heavy book.More photos available on request. Product Description: Forty years ago, Harriet Vanger disappeared off the secluded island owned and inhabited by the powerful Vanger family. There was no corpse, no witnesses, no evidence. But her uncle, Henrik, is convinced that she was murdered by someone in her own family - the deeply dysfunctional Vanger clan. Disgraced journalist Mikael Blomqvist is hired to investigate, but when he links Harriet's disappearance to a string of gruesome murders from forty years ago, he needs a competent assistant - and he gets one: computer hacker Lisbeth Salander - a tattoed, truculent, angry girl who rides a motorbike like a Hell's Angel and handles makeshift weapons with the skill born of remorseless rage. This unlikely pair form a fragile bond as they delve into the sinister past of this island-bound, tightly-knit family. But the Vangers are a secretive lot, and Mikael and Lisbeth are about to find out just how far they're prepared to go to protect themselves - and each other. About the Author: Stieg Larsson was the Editor-in-Chief of the magazine Expo. He was a leading expert on anti-democratic, right-wing extremist organisations. He died in 2004, soon after delivering the text of the novels that make up the Millennium Trilogy. A fine first UK edition in a fine dust jacket. Complete row of numbers to 1 on the copyright page. Alfred A. Knopf, 2008. US First Edition, First Printing Trade Paperback. Fine/No Jacket. ADVANCED READER'S EDITION, in excellent shape, no dust jacket issued. . Bubble wrapped and shipped in a box. We do not stock or sell ex-library or Book Club editions. New York: Knopf. Hardcover. 0307269752 all amermerican firsts. the girl with the dragon tattoo. the girl who played with fire, and the girl who kicked the hornet's nest. all handsome copies. . Fine. 2008. First American Edition. Maclehose Press, 2008 A very good first UK Edition of this surprise world-wide bestseller. Binding is cocked, buy tight and jacket in near fine with original price of 14.99 pounds present. The size of the printing in the UK was much smaller than the size of the printing in the US, where the hardcover edition eventually sold millions of copies and was the basis for a successful movie. CG.. 1st Edition. Hardcover. Very Good/Near Fine. 2009-06-04. New. Ships with Tracking Number! INTERNATIONAL WORLDWIDE Shipping available. Buy with confidence, excellent customer service! Quercus Publishing, 2008. First paperback edition-first printing. Paperback. Near fine. Near fine condition.Quercus Publishing,2008.First paperback edition-first printing(10 9 8 7 6 5 4 3 2 1).Uncorrected proof edition (Advance Readers copy).On the back of the cover it states Promotional Copy Not For Resale. Small format paperback(a couple of small nicks on the edges of the cover) in near fine condition.Nice and clean pages with a couple of small nicks and crease on the edges of the pages, the spine of the book is slightly bent.Nice and clean book.569pp including The Vanger Family Tree.A collectable and scarce first paperback edition-first printing. New York: Alfred A. Knopf, . First U.S. edition. A fine copy in a fine dust jacket. (13989). Octavo, boards. The first novel in this best-selling series and basis for the film(s). London: Maclehose Press, 2008. 1st UK edition, 1st printing, translated by Reg Keeland, large 8vo, 533pp, VG+/Fine Copy in VG+/Fine DJ. First Edition. Hard Cover. Very Good/Very Good. 8vo - over 7¾" - 9¾" tall. New York: Alfred A. Knopf, 2008. The first American edition of this bestselling Swedish mystery that was recently made into a film, and will soon be filmed again by Hollywood. The author Stieg Larsson died shortly after delivering this and 2 other manuscripts to his Swedish publisher. This is a superb pristine fine copy in a fine dustjacket. . First American Edition. Boards & Cloth with Dustjacket. 2008-08-05. New. Ships with Tracking Number! INTERNATIONAL WORLDWIDE Shipping available. Buy with confidence, excellent customer service! New York: KNOPF, 2008. Book. N-Fine. Hardcover. Signed Copy. First Edition/First Printing. A square solid tight carefully read copy. This copy has some light pagedge soil, some light board edgewear. Any other questions about this copy give me a call. The 24.95 jacket has a short nearly invisible scratch on the rear panel. A pretty nice over-all copy of the First US edition, a First Printing of a novel that has been re-printed so many times in hardcover that I have lost count. First novel, first book of a trilogy from the now dead author. Great read as is book two and three. We lost a great talent when this man died. This copy has been signed by the translator, Reg Keeland. The purchase of this copy will include a copy of my ticket to the signing, a picture of Reg signing books, a new DVD of the movie, a copy of the book Steig Larsson Our Days in Stockholm by a close friend Kurdo Baksi and a previewed copy of the audiobook in CD format.THIS COPY IS IN MY POSSESSION AND NORMALLY SHIPS NEXT DAY..
A near fine paperback with crinkles on cover & spine, edge wear first pages. 1st English Edition (rare copy) "PROMOTIONAL COPY NOT FOR RESALE" stated on the back of the cover. Reg Keeland (Translator) A spellbinding amalgam of murder mystery, family saga, love story, and financial intrigue.... It's about the disappearance 40 years ago of Harriet Vanger, a young scion of one of the wealthiest families in Sweden...and about her octogenarian uncle, determined to know the truth about what he believes was her murder.It's about Mikael Blomkvist, a crusading journalist recently at the wrong end of a libel case, hired to get to the bottom of Harriet's disappearance...and about Lisbeth Salander, a 24-year-old, pierced and tattooed genius hacker possessed of the hard-earned wisdom of someone twice her age, who assists Blomkvist with the investigation.This unlikely team discovers a vein of nearly unfathomable iniquity running through the Vanger family, astonishing corruption in the highest echelons of Swedish industrialism - and an unexpected connection between themselves. 2008-07-01. New. Ships with Tracking Number! INTERNATIONAL WORLDWIDE Shipping available. Buy with confidence, excellent customer service! MacLehose Press/Quercus, 2008. First UK edition-2nd printing. Hardcover. New/New. Mint condition.MacLehose Press/Quercus,2008.First UK edition-2nd printing(10 9 8 7 6 5 4 3 2).Red hardback(silver lettering to the spine) with Dj(small nick on the edges of the Dj cover),both in mint condition.The book is new with a small crease on the edges of the pages.533pp including The Vanger Family Tree.Price un-clipped.A collectable and scarce 2nd printing as the 1st printing.Heavy book. Product Description: Forty years ago, Harriet Vanger disappeared off the secluded island owned and inhabited by the powerful Vanger family. There was no corpse, no witnesses, no evidence. But her uncle, Henrik, is convinced that she was murdered by someone in her own family - the deeply dysfunctional Vanger clan. Disgraced journalist Mikael Blomqvist is hired to investigate, but when he links Harriet's disappearance to a string of gruesome murders from forty years ago, he needs a competent assistant - and he gets one: computer hacker Lisbeth Salander - a tattoed, truculent, angry girl who rides a motorbike like a Hell's Angel and handles makeshift weapons with the skill born of remorseless rage. This unlikely pair form a fragile bond as they delve into the sinister past of this island-bound, tightly-knit family. But the Vangers are a secretive lot, and Mikael and Lisbeth are about to find out just how far they're prepared to go to protect themselves - and each other. About the Author: Stieg Larsson was the Editor-in-Chief of the magazine Expo. He was a leading expert on anti-democratic, right-wing extremist organisations. He died in 2004, soon after delivering the text of the novels that make up the Millennium Trilogy. Toronto, Canada: Viking Canada, 2008. Book. As New. Hardcover. 1st Edition. First Canadian Edition/First Printing, with the appropriate number line beginning with 1.on the copyright page. Published simultaneously in America by Alfred A. Knopf. Hardcover. 465 pages. Translated from the Swedish by Reg Keeland. The first novel in the world-wide, and highly acclaimed Millenium Trilogy. 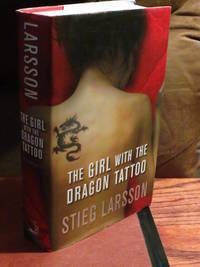 A true masterpiece, that introduced the world to Lisbeth Salander. Made into a highly acclaimed film in Sweden. The American version was released in the winter of 2011. A fine dustjacket over a fine book. A lovely copy. As new. Unread. From my smoke-free collection..
MACLEHOSE PRESS, 2008. UK First Edition, First Printing Hardcover. Fine/Fine. Protected in clear Mylar cover. Bubble wrapped and shipped in a box. We do not stock or sell ex-library or Book Club editions. New York: Knopf, 2008. 1st US Edition. Hardcover. Near Fine/Near Fine. Near fine and appears unread in a near fine unclipped dust jacket. New York: Alfred A. Knopf, 2008. First U.S. edition. Hardcover. First printing. Global literary sensation and the basis for two movies. A fine copy in a fine dust jacket. A fresh and clean copy. New York - Alfred A. Knopf, 2010 Book. FINE in a FINE d. Hardcover. An attractive collection of the Milennium trilogy by Stieg Larsson. Including:The Girl With the Dragon Tattoo (19th printing, 2010)The Girl Who Played with Fire (14th printing, 2010)The Girl Who Kicked the Hornet's Nest (Fourth printing, 2010)Translated from the Swedish by Reg Keeland. The two primary characters in the saga are Lisbeth Salander, a woman in her twenties with a photographic memory and poor social skills, and Mikael Blomkvist, an investigative journalist and publisher of a magazine called Millennium. Blomkvist, the character, has a history similar to Larsson, the author. Larsson planned the series as having ten installments, but due to his sudden death, only three were completed and published. Condition: In two-tone cloth bindings with original unclipped dustwrapper. Externally, smart, with only some very slight shelfwear. Dustwrappers are very smart, with only a couple of marks. Internally, firmly bound. Pages are bright and clean. Overall: FINE in a FINE dustwrappers. NY: Knopf. F. 2008. 1st American Edition. Hardcover. First U.S. Edition bound in black & orange boards. 8vo size, 465pp. A Fine, As new copy in fine dj. .
Alfred A. Knopf. Hardback. Fine/Fine. 2008. Hardback. Fine first edition first print in fine dust jacket protected with Mylar cover. Knopf Doubleday Publishing Group, 2008. First Edition. Hardcover Hardcover. Fine/Fine. Collectible First American Edition. Binding is tight, covers and spine fully intact. Dust Jacket NOT priced clipped. Deckled edges (rough cut). Text is clean and without markings. Dust jacket is now protected in a clear, removable, archival cover. Book is currently being protected (and ships in) a clear archival sleeve. Ships same day in bubble-wrapped AND BOXED w/ standard domestic shipping. Free tracking. Satisfaction 100% Guaranteed. ISBN: 0307269752. ISBN/EAN: 9780307269751. New York NY: Alfred a Knopf, 2008. Book. Fine. Hardcover. First Edition. 2008 Knopf Stated First American Edition/First printing in NF/F condition. A terrific copy with no discernible wear save for 2 small discolored spots on the front board ( printing error, perhaps?) and the first book of the late Larsson's Millenium Trilogy. save for a very small slit repaired along the DJ's spine. There is no remainder dot on the bottom. **BONUS** Also receive the 2009 Knopf First Edition/ First printing of The Girl Who Played With Fire also in F/F condition and the 2010 American First of the Girl WHo Kicked the Hornet's Nest..
Westminister, Maryland, U.S.A.: Alfred a Knopf Inc, 2008. 1st Edition . Hardcover. New/New. 8vo - over 7¾ - 9¾" tall. Correct number line sequence, no writing, marks, underlining, or bookplates. No remainder marks. Spine is tight and crisp. Boards are flat and true and the corners are square. Dust jacket is not price-clipped. This collectible, " NEW" condition first edition/first printing copy is protected with a polyester archival dust jacket cover. Beautiful collectible copy of the first book of the trilogy of the now dead author. Very scarce book. 2015-05-01. New. Ships with Tracking Number! INTERNATIONAL WORLDWIDE Shipping available. Buy with confidence, excellent customer service! Alfred A, Knopf, 2008. Advance Reading Copy with publisher's slip laid in. Fine in white illustrated wraps, in a near-fine proof dust jacket (different from the trade edition as the flaps are white with no text) with a slight vertical fold mark to spine. Scarce in jacket.. 1st Edition. 2009-06-23. New. Ships with Tracking Number! INTERNATIONAL WORLDWIDE Shipping available. Buy with confidence, excellent customer service! 2009-03-02. New. Ships with Tracking Number! INTERNATIONAL WORLDWIDE Shipping available. Buy with confidence, excellent customer service! Alfred A. Knopf. Hardback. Very Good/Very Good. 2008. Hardback. Very good first edition first print in fine dust jacket protected with Mylar cover. 2009-06-09. New. Ships with Tracking Number! INTERNATIONAL WORLDWIDE Shipping available. Buy with confidence, excellent customer service! 2008-02-03. New. Ships with Tracking Number! INTERNATIONAL WORLDWIDE Shipping available. Buy with confidence, excellent customer service! 2008-07-04. Good. Ships with Tracking Number! INTERNATIONAL WORLDWIDE Shipping available. May not contain Access Codes or Supplements. May be ex-library. Shipping & Handling by region. Buy with confidence, excellent customer service! 2011-11-22. New. Ships with Tracking Number! INTERNATIONAL WORLDWIDE Shipping available. Buy with confidence, excellent customer service! 2015-01-01. New. Ships with Tracking Number! INTERNATIONAL WORLDWIDE Shipping available. Buy with confidence, excellent customer service! 2011-07-05. New. Ships with Tracking Number! INTERNATIONAL WORLDWIDE Shipping available. Buy with confidence, excellent customer service! 2011-10-27. New. Ships with Tracking Number! INTERNATIONAL WORLDWIDE Shipping available. Buy with confidence, excellent customer service!